Born in 1891, Harry was Christened John Henry, the son of Edwin Holmes, a native of rural Shropshire, and his wife, Elizabeth (nee Davis), an Irish immigrant. He was the youngest of at least five children, his siblings being; Eaton, Jessica, Edie and Edwin [age order uncertain]. It’s believed his mother died when he was about 18 months old. The first story I heard of Harry was of him becoming the toast of his peers when he broke up the cane that had been used by a sadistic teacher to thrash his sister. He was only eleven at the time but, knowing he couldn’t possible return to school, he went out to earn a living as a farm labourer. On reaching maturity, he went in search of the big money paid to coal miners in South Wales. The only real mention of this time was him talking about it being the norm for the men in the digs to take a bath on the hearth and the women’s duty being to scrub them down. This lifestyle came to an end when he and a friend unintentionally killed a pit pony with a loose coal wagon. Fearful of the repercussions which would be not only getting the sack but having to compensate their employer, they decided to leg it. With prospects for two scallies on the lamb rather bleak, their only source of future employment appeared to be a career in the armed forces. Having strange aspirations in all things equestrian, they went for the Royal Horse Artillery. However, their dreams of riding around like the mounted gentry were soon shattered when they were put to work in the stables. 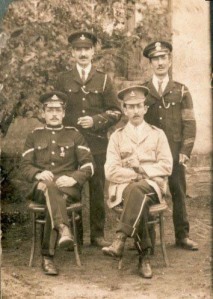 It wasn’t long before, as Harry himself put it, ‘We got fed up of cleaning dirty ‘osses asses…’ So they took unofficial indefinite leave (some would say deserted) and set off to join Harry’s brothers, Eaton and Sergeant Ted (Edwin), in the South Staffordshire Regiment. Harry got off to a good start in his new regiment by facing a drunk and disorderly charge. His case at the hearing was preceded by one of an old sweat facing a similar charge for the umpteenth time. Noting that “the sweat” pleaded not guilty and got away with a reprimand, Harry decided that as a new boy up for the first time, a guilty plea would get him off Scott free. Unfortunately, that was not the case. To make an example of him and as a future deterrent, he got two weeks in the glass-house (military prison). The only bit of redemption was having a sergeant brother who could pull strings to make life just that little bit easier. Harry spoke little of these times in the trenches. He only gave a clue to the conditions by telling how some men would slit their armpits with razor blades to release the lice that had actually got under the skin. He also mentioned men being strapped spread-eagled to the wheels of field guns as punishment for the slightest signs of cowardice (just being scared was enough to merit this punishment). ‘… the recoil of the gun would almost tear their limbs from the sockets…’. The chronological order of events from there is uncertain but Harry was trying to escape from somewhere with a few others when they got separated from the main British force. 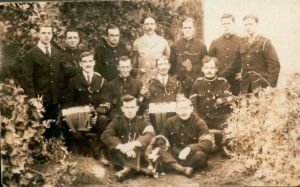 Eventually they joined up with some Black Watch, commanded by ‘The Mad Major”. Apparently, this officer was more than a little fond of his native tipple and was rarely seen without a bottle of whisky in his hand. But Harry’s time with The Mad Major was short-lived. The advantage, as it did so often in that war, swung the other way, with the German’s getting the upper hand and routing the major’s command. The commander was the only one to stand his ground. With his whisky in one hand and revolver in the other, the major defied the enemy to take him alive. Despite being given every opportunity to concede, he refused. Once captured, Harry received medical treatment for his wounds: ‘…better than I would’ve got from my own lot…’ and was despatched to a POW camp in what I believe is now Poland. From what he said, he only got into trouble twice in the camp. Once when he attacked a guard with a hoe for calling him a “swine-hound”. It turned out to be a complete misunderstanding. The guard was only passing comment that the hard ground was a “schweine-hound” to hoe. 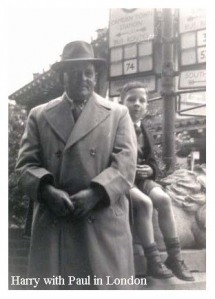 This gave Harry the incentive to learn German and by the time he left the camp he was almost fluent. Harry is Middle row, far right. His uniform is interesting. Apparently they were sent standard uniforms, without any of the trimmings. The Germans gave them large pieces of yellow cloth to sew on patches, indicating they were POWs. Harry had other ideas: Knowing how much more respect his captors had for mounted guardsmen, he used the yellow patch to suitably mock up his plain uniform. It’s doubtful if even the corporal’s stripes are genuine. A fellow prisoner relayed the second incident: ‘Life wasn’t bad. We were treated well by our captors. The only humiliating thing was being turfed out of the hut of a morning and counted. ‘I suppose, more out of boredom than anything, we decided to make a stand. Knowing the guard who usually got us up was Austrian and could therefore not do anything drastic, like shooting us, without German permission, we all agreed that we would refuse to leave the hut. “Bugger off!” Harry told him. ‘There was a stand off for some considerable time. Then, in frustration, the guard levelled his rifle at us. “Bugger off!” Harry told him again, as the rest of us legged it outside. Having had enough of Harry’s disruptive behaviour the Germans farmed him out to a Polish farmer as an unpaid labourer. This suited all parties; not only was the quality of life improved for his captors but for Harry too. Although he received no wages he enjoyed the best of accommodation, food and drink, even being taken out to a pub on regular basis. Such was his acceptance into the Polish family he stuck up a relationship with the daughter. 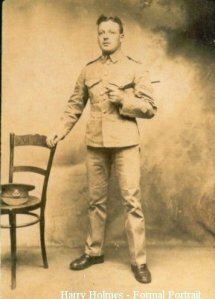 His closeness to the family, in particularly to the daughter, grew so intense that when the armistice came it wasn’t in the interest of to anyone to acknowledge it. So badly did they want him to stay the Poles kept it from him for quite a while. So long in fact that he missed the boat home with all the other liberated prisoners and only reluctantly made his own arrangements later. Once back in England Harry was demobbed back into “Civvy-Street” working on the railways. 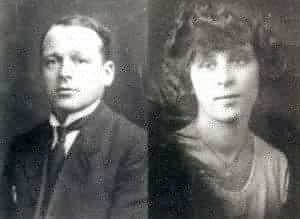 Being on track laying, I imagine he would’ve travelled around quite a bit before arriving in Smethwick, where he met and married Jessica Grace Clifford (Jess, as Harry called her), a young lady, fourteen years his junior. They settled into a house rented from the railway company in Wellington Street, Winson Green in Birmingham. Harry, although a staunch socialist, was at first reluctant to come out with the rest of the railway workers in support of the miners. But living next door to a union leader, his contention that the strike was doomed to failure didn’t carry much weight. As things turned out, despite his initial reluctance to strike, Harry was one of the last railway men to go back – long after his union colleague. As a socialist, he once met Oswald Moseley campaigning for a Labour constituency seat. ‘He came into the pub saying how, if he wasn’t skint, he’d buy us all a drink. So I fell for it and bought him a pint. He said he’d look after us all, especially me when he got his seat. The bugger! I haven’t heard from him from that day to this.’ Harry told me in the mid-sixties. However there were instances where there proved to be similarities: Harry nearly took off the drill sergeant’s thumb when he used an unsheathed bayonet for practice. When the officer asked where the scabbard was, Harry explained that he’d thrown it away because it was rusty. Then Don was in trouble for parading without a helmet. When he explained that he’d lost it, the sergeant suggested he use his initiative to get another. On the next meeting it was the sergeant who paraded bareheaded. When Harry wasn’t maintaining the freedom of Britain by defending the Endwood against invasion, he was working under atrocious conditions, repairing bomb damage to the railway network. There was an occasion when he was on his way home and he came near to being blown apart by a German bomb. Typically unflustered by the near miss, he was delighted to find a piece of shrapnel to take home to Jess as a memento. When he presented it to her, it was still so hot she instantly dropped it. How he’d carried it in his bare hands remains a mystery to this day. With the kids away at Harry’s sister’s place in Conwy, Jess did her bit for the war effort by taking a job as a clippie on the buses. When not at work or Home-guarding, Harry would indulge in his favourite pastime of supping ale. This led to Jess being called into the boss for a reprimand for inappropriate behaviour towards passengers. She had been reported for throwing some poor old gentleman off her bus, together with his dog. All came to nothing when she explained that the “poor old gentleman” was her drunken husband, and the dog was almost as inebriated as its owner. 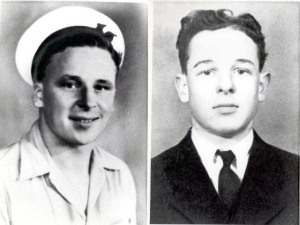 Despite being in reserved occupations, towards the end of the war, Harry’s two sons considered themselves old enough to volunteer for active service. Both joined the Royal Navy: Don served with the Fleet Air Arm on the carrier, H.M.S. Venerable, in the Pacific and Edwin on the mine-sweeper, H.M.S. Liberty, in the Mediterranean. Besides Edwin dying so close to the end of the war, I think Jess was dismayed that he went as a volunteer and didn’t really need to go. Harry never talked about it, at least not to me, but I can’t help thinking how much the irony of losing first a brother named Edwin and then a son, must have affected him. Other than drinking, gardening was probably the only hobby Harry pursued. He grew beautiful dahlias and chrysanthemums, in ground dug and prepared with an LMS Fireman’s shovel (not a spade) and a four-foot crowbar. To protect the cherished flowers Harry devised a self-closing garden gate. The mechanism consisted of a counterweight of a large brick, suspended on a rope, which would automatically close the heavy timber gate once someone had entered. However, if the person didn’t move swiftly enough once they had entered the garden, they were at risk of serious injury. Such was the efficiency of the device that it was quite capable of hitting a person in the rear, knocking them the full length of the garden path, then up and over the far wall onto the railway bank. Yes, Harry was very protective of his blooms. Other than the gate, the main fencing was fabricated from old railway sleepers, which mysteriously used to fall off a train waiting at the signals on the railway at the back of the garden, and roll down the embankment. “The ol’ corral” as, Don, christened the structure. This went down like a lead balloon with Harry, who was not noted for his appreciation of sarcasm. In fact, he couldn’t see it being any funnier than Don asking him if he was growing paper bags when he’d have his pride blooms protected from the frost with them. The last one I remember suffering this fate was Thomas, the cockerel. Having watched his harem disappear one by one, he was rather cuter than them and took a lot more catching, escaping several times into various neighbouring gardens. Eventually Harry’s persistence was rewarded and Thomas’ life was brought to an inevitable end. But all these efforts turned out to be wasted; Harry’s family, having developed a certain fondness for Thomas refused to eat him. Another example of Harry’s D.I.Y capabilities being tested came when Kate (Kathleen) smashed a ball through a neighbour’s window. As was the custom in those days, it was up to the child’s father to make good any damage. Harry set about the repair with a sheet of glass and putty, standing on an old apple barrel, which Jess had suggested may not take his weight. ‘… course it bloody will,’ he insisted. And it did until he was just finishing off. The pane was in and he was smoothing the putty when the barrel gave way. Down Harry went, putting his fist through a lower pane in his descent, he landed in the barrel, which immediately toppled over and rolled him down the yard. As this action took place in a communal yard, there was no shortage of spectators to witness Harry’s indignity. But, as Harry’s temperament was known to most, there was only one who was foolish enough to comment on the event. Peter, a not so streetwise child from the top house, chased after Harry in the rolling barrel. When it came to a stop, he asked with an air of genuine concern if Harry was all right. More aware of Harry’s temperament, the rest of the gathering merely stood around, doing their best to stifled giggles. And it wasn’t just at home that Harry had runs of bad luck. Not wanting to see pints of blood on top of several pints of M & B’s we’d consumed that night, Don and I took ourselves off to bed. Then he had the misfortune to suffer gout. Again, despite a seriously painful, swollen foot, he did not neglect his duty to visit The Railway. All went well until he was about to make his way home. Not quite taking as much care, as he should, he stepped into the gutter as a friend was reversing his car. The driver was unaware of the problem until he heard muffled roars. When he felt the hammering of a fist all but caving in the roof of his pride and joy, he immediately stopped, jammed the handbrake on and got out of the car to investigate. He was horrified to find that he had Harry’s gouty foot still trapped under the rear tyre. Again, hardly being able to walk did not interfere with Harry’s lifestyle; his usual pattern of working and drinking had to be maintained. There was only one time that I can recall Harry having time off work. The pneumonia he’d developed was so severe; it wasn’t only his immediate family that thought he would not survive but the doctor as well. I recall him being laid up in bed for about a fortnight. It was the first time I had witnessed a fire in any of the bedrooms. To me, it seemed he just lay there continually sweating. It frightened the hell out of me seeing a man I’d perceived as indestructible in such a terrible state. As if things weren’t difficult enough for Jess trying to nurse him at home, one cold night we lost our electricity supply. Don checked it out and discovered that there was no supply from the main, sealed fuse. The M.E.B. was contacted but dragged their feet for so long that Don took matters into his own hands. He broke the seal and repaired the blown fuse. Harry didn’t die. He made a full recovery and went back to working with his “bloody Eye-Tye” gang. If nothing else, Harry appeared to have rather a conflicting relationship with these Italian work colleagues. For instance, I couldn’t work out, if there was so much irritation between them, why they always brought him presents back off holiday. Then, in unguarded moments, he would mention going drinking with them. It was only after Harry retired that I got a clue to the true situation. I was having a drink with him in the Railway, when his old gang of “Eye-Tyes” arrived. Beer began to flow like it was going out of fashion and I found myself in conversation with Mario, who appeared to be the leader. Harry’s eventual retirement from the railways was a bit confusing to me. I recall he worked well over retirement age and had to have a medical every year. I think he must’ve been over seventy when, at one of these check ups, the doctor suggested that he would be wise to cut down on the cigarettes. He’d smoked since he was thirteen, having up to forty Senior Service or Players every day of his adult life. So, that was the end of the fags. From then on he would have the odd Castella cigar with a drink and that was it. As can be imagined, retirement wasn’t something the likes of Harry would look forward to. And this is where it gets confusing. He eventually retired from the Railways but took a sort of “wind-down” job with McAlpine’s (probably something to do with Railway contracts, I’m not sure). This involved being in an office and answering a phone. Being a man who had worked out in the open all his life, it is easy to imagine how poorly Harry coped with this. Apparently, every time the phone rang he’d walk outside to avoid answering it. I can’t remember whether it was his initial retirement or when he left the McAlpine job that he went on a bender and arrived home in the late afternoon on his hands and knees. His trousers were covered in mud, he couldn’t remember were he’d left his overcoat with his severance pay and holiday money in the packet, and he was bent on going to the Railway as soon as they opened. Eventually, he conceded to Jess’ demands that he should at least have something to eat before going out again. ‘… but can you nip down and tell Big Harry (Harry Moore, the landlord of the Railway) that Little Harry will be late?’ He asked me. Fortunately, shortly after eating, he fell asleep. 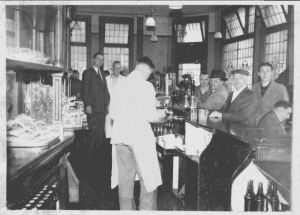 This gave us the opportunity to turn his watch and the mantelpiece clock onto closing time. The following day, much to Jess’ relief, his coat and money were traced to the pub where he had rendered himself legless. Realising that Harry would probably be lost with little to do and no doubt miss his “Eye-Tye” colleagues, Don rented him an allotment off Perrott Street in Winson Green. But Harry wasn’t about to conform just yet. Knowing his interest in gardening, the brother-in-law of one of Don’s friends, asked if Harry could look after his garden and greenhouses while he was on holiday. ‘… and just keep an eye on that barrel in the corner of the shed, cos that’s me best home brew,’ He foolishly told Don and Harry. The outcome was predictable. The bloke returned from holiday to find his blooms in perfect condition and his barrel empty. It’s uncertain whether or not the minders’ suggestion that the barrel must have sprung a leak was believed. Whatever was thought of then, they didn’t give a damn – the beer had been exceptionally good. Another lifestyle change came when our house in Wellington Street was earmarked for redevelopment and we were moved to the luxury of a brand new ground floor maisonette in Ladywood. Bathroom, hot and cold running water, under-floor heating, it was heaven on Earth. Of course the garden wasn’t great but it was big enough for a few rose bushes and other bits and pieces. Harry initially also missed Big Harry’s brew but it wasn’t long before he settled into the St. Vincent. It was September 1976 and I was living in Ireland when I got the phone call to say Harry had died suddenly of a massive heart attack. Apparently, since I’d left home he had become quite domesticated (for the first time in his life) and had returned from a shopping trip with Jess, complaining about pains in his chest. He lay down to rest and died. Harry Holmes will not go down the annals as achieving anything spectacular. He wasn’t rich and he wasn’t famous. He didn’t contribute anything absolutely fantastic to the world. He was just a man; a man who merely lived his life as he thought it should be lived. He was no angel and, even though he may have lived his life with less compromise than he should have, he was no devil. Whatever he did or didn’t do, he will always be a legend to me because Harry Holmes was my dad. In the end, I believe the most perfect thing about Harry’s life was probably his death. Surely, when your time is up, that has got to be the best way to go.